Former Atlanta Thrashers top prospect Alexander Burmistrov really tried to make things work in the NHL. He committed to developing in North America with the OHL’s Barrie Colts, put up decent numbers as a young pro with the Thrashers/Jets, and even after a brief stint in the KHL, returned again and worked hard to find a fit in stops with Winnipeg, the Arizona Coyotes, and the Vancouver Canucks over the past two seasons. Burmistrov’s effort was there, but things just didn’t pan out and he returned to the KHL last season. Unlike in the NHL, teams in Russia are excited to have Burmistrov and willing to give him the benefit of the doubt even when his production doesn’t match the hype. Case in point: after returning to Ak Bars Kazan last year, Burmistrov registered six points in ten games, just three points in 17 playoff games, and has just five points in 27 games this year. Yet, Salavat Yulaev Ufa announced yesterday that they had acquired Burmistrov from Ak Bars for a trio of promising young players. The centerpiece is 24-year-old center Vyacheslav Osnovin who, at five points through 32 games, isn’t far off Burmistrov’s scoring pace. 19-year-old defenseman Alexander Lyakhov has been held scoreless in ten KHL games this season, but has the size and skating to make an impact down the road. Saveli Kuvardin, 17, is the final piece; a draft-eligible forward without any KHL experience, but with strong numbers in Russia’s junior ranks. A similar trade of this magnitude would never have been made to acquire Burmistrov in the NHL, but those are the perks of playing in your home country as an established pro. Now Burmistrov can get a fresh start in Ufa and hopefully make the deal worthwhile for his new team. Viktor Svedberg was once considered to be a future fixture on the Chicago Blackhawks blue line, but after spending the past two seasons exclusively with the AHL’s Rockford Ice Hogs, he returned to his native Sweden this off-season. That stay didn’t last long, as Svedberg has left the SHL’s Linkoping HC after just seven games to sign with the KHL’s Barys Astana, the league’s entry in Kazakhstan, per a team release. Svedberg is far from a flashy player, but even as a 22-year-old rookie back when he first signed with Chicago in 2013, was a solid stay-at-home defender in the AHL. A reliable presence on the back end, Svedberg should help out Barys, a top ten team in the KHL, in their pursuit of a title. Former Buffalo Sabres defenseman Brady Austin was unable to turn his PTO with the AHL’s Stockton Heat into a contract this year, despite accomplishing the same goal on a tryout with the AHL’s Cleveland Monsters before last season. Without an opportunity in North America, Austin has signed on with the Esbjerg Energy of the Metal Ligaen in Denmark, the team announced. A low-level pro league, the Metal Ligaen has attracted very few NHL veterans. Yet, Esbjerg has managed to sign Austin and Brett Bellemore in the past week, boasting a blue line with two experienced North American pros. This would seemingly vault the Energy to one of the favorites to win the league championship this year. Wednesday: Burmistrov has signed a one-year deal with Ak Bars Kazan of the KHL, where he will continue his playing career. Sunday: NHL player agent Dan Milstein announced that Vancouver Canucks center Alexander Burmistrov has announced his retirement. Burmistrov had recently talked about his frustration with his role with the Canucks. He was a healthy scratch last night against the Blues and only had 4:53 minutes of ice time Thursday against San Jose. The 26-year-old signed a one-year deal with Vancouver in July after splitting last year between the Winnipeg Jets and the Arizona Coyotes. He had spent five years with the Winnipeg Jets/Atlanta Thrashers organization after being the eighth-overall pick in 2010, but was waived in January by Winnipeg and Arizona claimed him. Burmistrov never lived up to the billing as his best year in the league was back in 2011-12 when he scored 13 goals and 15 assists in 76 games in the Winnipeg Jets’ first year after moving from Atlanta. He played a total of 348 games, scoring 37 goals and 101 points. He had two goals and four assists in 24 games this season. Through 18 games this season, Burmistrov has a goal and four assists but is averaging a career-low 11:51 per night of ice time. While it was looking like he’d be a candidate to move up in the lineup with Bo Horvat out for the next six weeks, even that appears to be in question now following their recent acquisition of Nic Dowd; it’s unlikely that they parted with an intriguing prospect in Jordan Subban to get someone that they plan to keep as a reserve forward. Center Brandon Sutter is also expected to return next week from an upper-body injury which could push Burmistrov down the depth chart even further. Burmistrov is making $900K this season and is eligible for restricted free agency with arbitration rights next summer. However, given his small role and inconsistent performance, there likely isn’t much of a trade market for him despite the affordable cap hit. As a result, unless Vancouver decides to waive him down the road, Burmistrov’s situation and role won’t be changing for the better in the near future. While the Wild aren’t expected to be too active in free agency, they have expressed an interest in signing center Matt Cullen, reports Michael Russo of the Star-Tribune. The 40 year old is from the area and has played there before, suiting up for Minnesota from 2010-11 through 2012-13. However, Cullen has yet to make a decision on his playing future, although Russo notes that he is intrigued by the idea of going back to Minnesota. That said, the thought is that he has been leaning towards retiring as a Stanley Cup champion. If he does decide to play another season, Cullen should still be able to provide a team with quality bottom six production. He picked up 13 goals and 18 assists in 72 games with the Penguins this past season while surpassing the 50% mark at the faceoff dot for the seventh straight season. The Canucks are showing interest in center Alexander Burmistrov, reports Sportsnet’s Elliotte Friedman (Twitter link). The 25 year old is on the open market after Arizona failed to tender him a qualifying offer earlier this week. Burmistrov started this past season with Winnipeg but struggled mightily, recording just two assists in 23 games before the Jets placed him on waivers. The Coyotes picked him up and he fared quite a bit better, scoring five goals while adding nine assists in 23 games while seeing his ice time jump to over 15 minutes per night. He could represent a buy low candidate that’s capable of playing a third line offensive role in the right situation. Four teams have expressed an interest in signing unrestricted free agent winger Shane Doan, notes Craig Morgan of Arizona Sports (Twitter link). His agent, Terry Bross, said that a decision won’t come quickly. The 40 year old has spent the entirety of his 21 year NHL career with the Coyotes (and original Winnipeg Jets) organization but the team announced earlier this month that they would not be offering him a new contract. Doan is coming off his lowest full-season output since 1998-99 after collecting just six goals along with 21 helpers in 74 games. The Red Wings are interested in blueliner Luke Witkowski, reports MLive’s Ansar Khan. The 27 year old split the season between Tampa Bay and their AHL affiliate in Syracuse. In 39 NHL games, he had four assists and 39 penalty minutes while logging 9:52 per night. He added five assists and 59 PIMS in 19 minor league contests. Detroit is believed to be looking for some grit on their back end and head coach Jeff Blashill is familiar with the Michigan native who coached Witkowski back at Western Michigan in 2010-11. Although he received a qualifying offer on Monday, goaltender Marek Mazanec will not return to the Predators next season, GM David Poile told reporters, including Adam Vingan of the Tennessean (Twitter link). The netminder spent most of the season at the minor league level despite beginning the season as the backup to Pekka Rinne. In 47 games with AHL Milwaukee, he had a 27-17-1 record with a 2.67 GAA and a .912 SV%. However, he struggled in his four games with the Preds, posting a 4.72 GAA with a .839 SV%. In a surprising turn after today’s Arizona dealings, Craig Morgan of AZ Sports reports from a scrum with GM John Chayka to not expect the Coyotes to retain Alexander Burmistrov. The young center is a restricted free agent, so presumably Morgan means that the team will not extend him a qualifying offer. The Coyotes have acquired both Derek Stepan and Nick Cousins to fill out their center position, though Burmistrov did show off his potential down the stretch last season. After being selected off waivers from the Winnipeg Jets, Burmistrov scored 14 points in 26 games for the Coyotes and seemed to fit in as well as one could expect. He would unfortunately miss almost a month after a hit from the Bruins’ Colin Miller caused him to have to leave the ice on a stretcher. The eighth-overall pick of the 2010 draft has been a disappointment thus far in his NHL career, reaching a high of 28 points in 2011-12. Though he played center for much of his time in Arizona, Winnipeg had nearly given up on him at that position. With a career faceoff winning percentage of 42.3%, and a still unrefined defensive game Burmistrov is a risky fit in the middle of the ice. That’s not to say he couldn’t improve, but as he turns 26 this fall it seems unlikely. He still possesses an ability to make highlight reel passes, and shows flashes of game-altering skill, but has never been able to do it on a consistent basis even in a single game. With a clear mandate from ownership to compete this season, the Coyotes can no longer waste time trying to develop failed prospects. The free agent period is now less than one month away from opening up and there are several prominent players set to hit the open market while many teams have key restricted free agents to re-sign. Here is a breakdown of Arizona’s free agent situation. 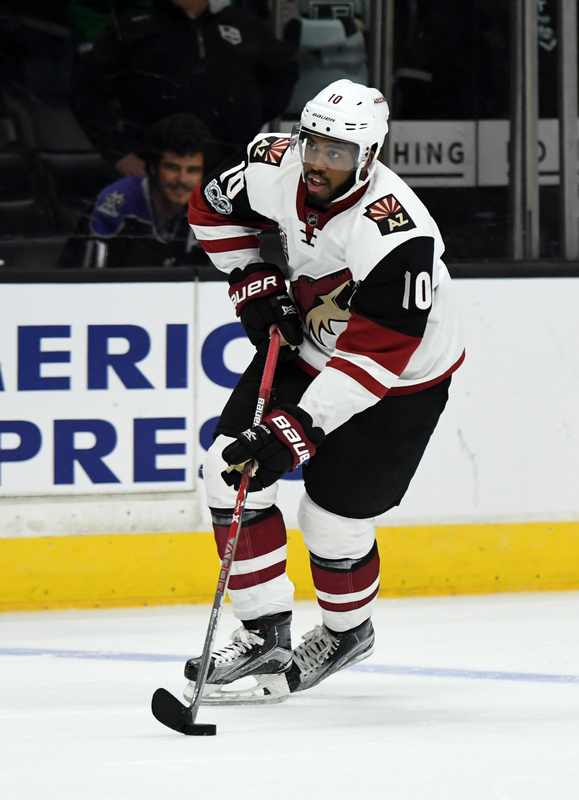 Key Restricted Free Agents: F Anthony Duclair – 2016-17 was a tough season for the 21 year old. After putting up 20 goals and 44 points in 81 games in his first season in the desert, he had just five goals and 15 points in 58 NHL contests this season. He was also sent to the AHL where he managed just a single tally in 16 games. Given the success he had prior to this past season, he could still make a case that he’s worthy of a decent raise coming off his entry-level deal. His struggles have led to some speculation that he could be dealt during the offseason. If he’s not, a one year contract would be a likely outcome to see if he gets back to his sophomore season form before giving him a sizable pay jump. F Alexander Burmistrov – The Russian center made a pretty good impression after being picked up off the waiver wire from Winnipeg, collecting 14 points in 26 games while seeing his ice time jump to over 15 minutes per game. However, he is due a qualifying offer of $1.6MM which may be a bit too high for Arizona’s liking considering how much he struggled with the Jets. GM John Chayka will have a decision to make as to whether he’s worth that qualifier or whether they’d be better suited to not tender him one and then try to negotiate a cheaper deal later on. Key Unrestricted Free Agents: F Shane Doan – While he’s coming off a down season, there’s no doubting that Doan remains the face of the franchise in Arizona. The 40 year old has suggested in the past that he wouldn’t likely go elsewhere in free agency (although he was reportedly open to moving as a rental player at the trade deadline if the perfect situation were to come up). If he were to sign on for another season, it would likely come at a rate below the $3.86MM base salary (before performance and signing bonus deferred payments) he earned this past season. F Radim Vrbata – Vrbata is coming off a resurgent season after returning to the desert on a one year, incentive-laden contract last offseason. With 55 points, he’s the second highest point producer that’s slated to hit the open market; only Washington’s T.J. Oshie (56) had more. The soon-to-be 36 year old has had success in each of his three stints with the Coyotes but has been inconsistent when he’s with other organizations. Despite that, the weak free agent market should help him land a lot more than the $1MM in guaranteed money he settled for last summer. Projected Cap Space: After finishing the season in LTIR with zero cap space having taken on several large contracts for players who weren’t playing for them, Arizona has just over $47MM committed to 17 players per CapFriendly, giving them plenty of room to work with under the cap. However, they’re a lower budget team so it’s not likely that they’ll be adding big ticket deals in free agency but it wouldn’t be surprising to see them try to take on a cumbersome deal for a player who’s out long-term in exchange for a younger asset, something Chayka has already done in his brief stint as GM.